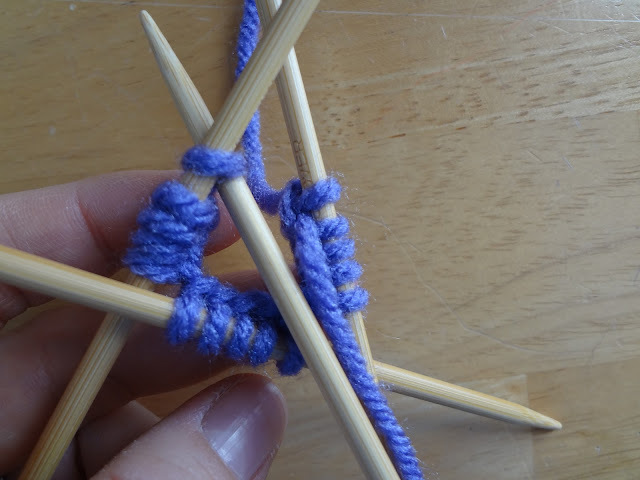 When I was learning to knit, double pointed needles were something I didn't even bother with at first because I felt like they were only for professional knitters or those who have been knitting forever. While they do take some practice, as they can be a bit fiddly, they're not so bad...in fact, by the time I was on my second or third project with them, I felt like a seasoned veteran! To knit with double pointed needles, you need some yarn and a set of needles. 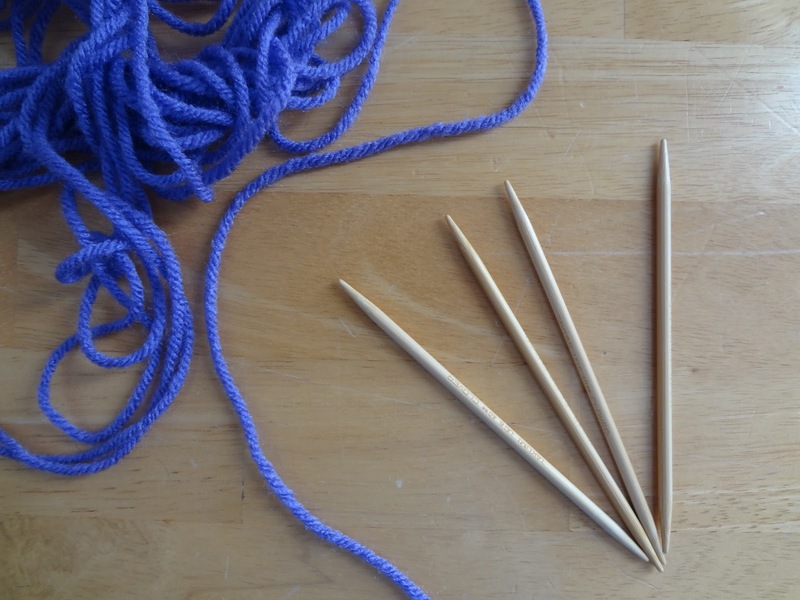 Like regular needles, they are available in a variety of different materials like metal, bamboo, plastic, and wood. Try some antique shops too for more unique and harder to find materials. They normally come in sets of five...for this tutorial we'll use four. I prefer bamboo myself, because they are less slippery and the yarn hangs on a little better, but it's your preference of course. So, we'll use four needles, three to hold the work, and one needle to work the stitches. 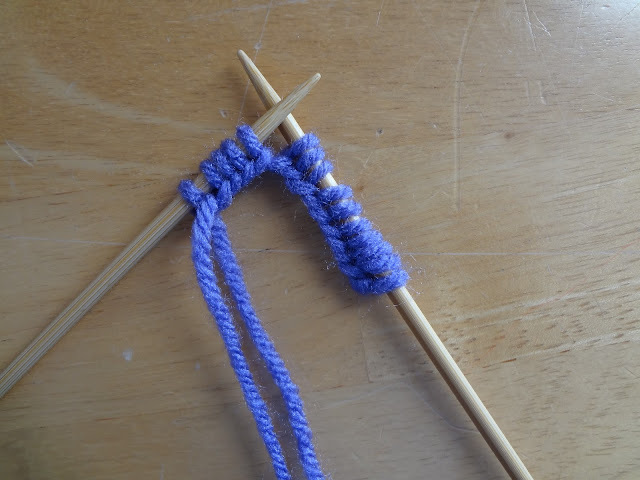 Using one of the needles, cast on the number of stitches needed...we'll cast on 15 here. There! 5 stitches remain on the first needle and 10 are now on the second needle. Now, with the third needle, slip five stitches onto it, so you have 5 stitches on each needle. 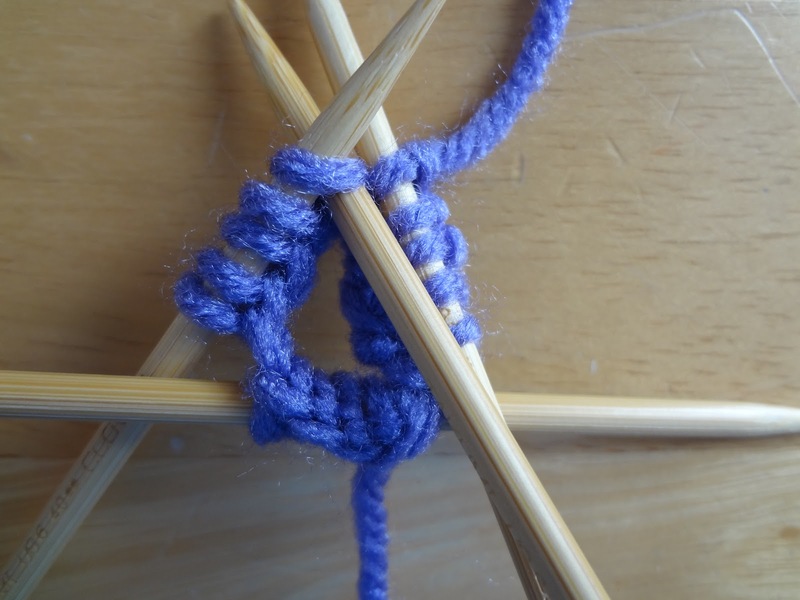 It's very important too that the stitches are facing in on all three sides, be very careful not to twist as you work. Now we need to join to begin knitting in the round...holding the needle with the tails in your right hand, go ahead and knit that first stitch...to do that take the fourth needle that you haven't used yet and insert it into the first stitch that is in your left hand--knit the stitch, pulling snugly as you go so there is no "laddering" or loose stitches where each round begins. Knit across the first needle as you would with straight needles, and take notice...the needle that just held the stitches is now empty of stitches and free to work the stitches on the next needle. The first round is usually the most fiddly, once you get a round or two knit, things will straighten out and get easier as it begins to take shape. Keep knitting each round until your seamless tube is desired length, taking care to pull snugly at the beginning of each round and in between each needle. 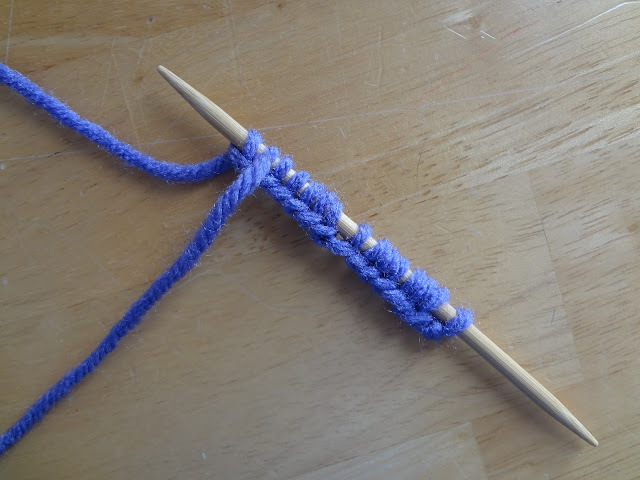 When you get to the desired length, simply bind off as you normally would. There you have it! 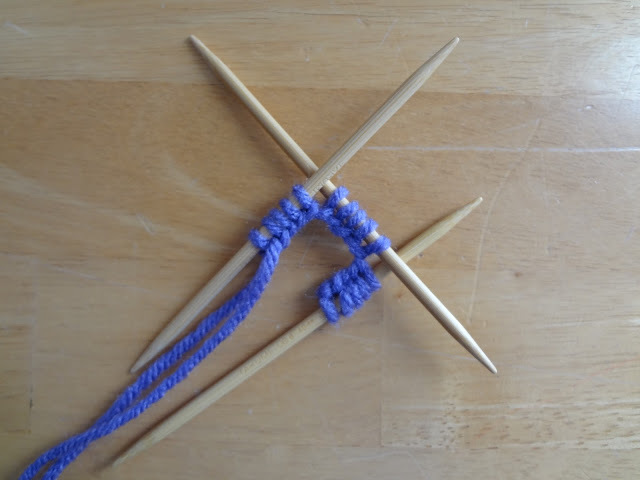 Be sure to practice, some of you knitting wizards may do it perfectly from the get go, but if you're like me, you may have to practice a few times. 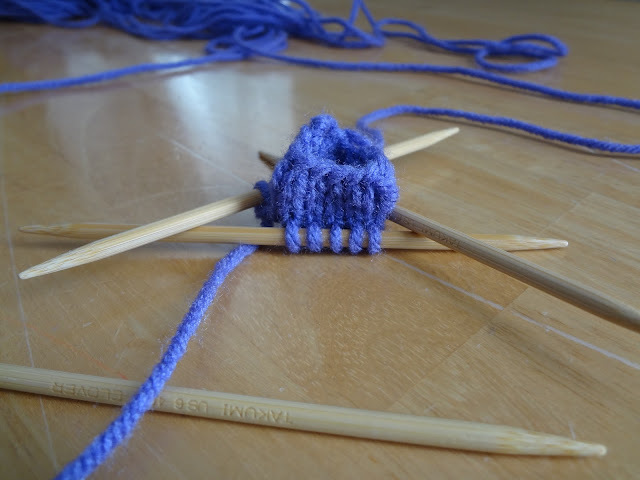 Another interesting thing about knitting in the round is that to create stockinette, you knit all of the rounds (no purling!) Now you'll be able to seamlessly knit sleeves, tiny hats, mittens, and other narrow tubes in the round! Awesome! I get so confused with these! First of all you are so welcome! I love to share! And about the DPNs, yay! I totally understand...I taught myself and I was more than intimidated, but it's not so bad and the more you do it, it becomes second nature. I am so glad it helped...my main goal is to make the process easy to learn and fun!!! Hello I would love to see this on YOUTUBE. You are doing AWESOME !!!! Thanks Peggy! I will definitely put it on my "to-do" list just for YOU! Well, you are good!! I am so thankful! 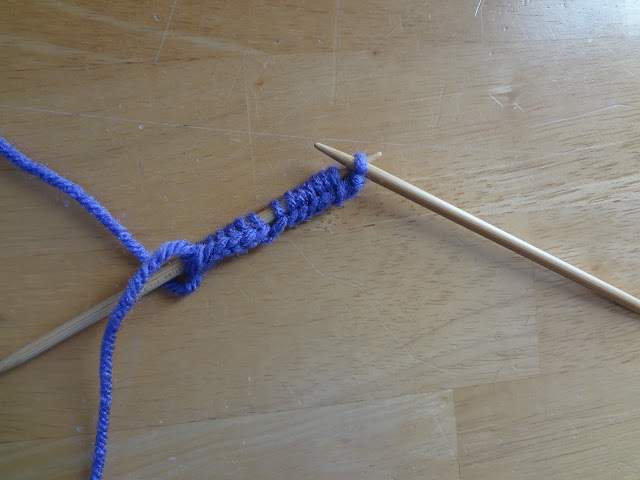 My new years resolution was learn to knit! With some (lots) of help from Nan-in-Law I completed some squares which weren't so square as I kept gaining stitches! When I mastered that I thought more of a challenge would be good for me and I am just about finished on my first project (a coat for my dog!!) and now I want to try convertible mittens...all patterns are in the round or on double ended needles, which I had no idea even existed. Thank you so very much, I have been cruising the internet for hours looking for an easy to understand tutorial. I shall give it a go.